For online retailers, ’tis the season of good cheer and record profits, but also of stressed out gift- givers who want to make doubly sure their packages arrive by December 24th. 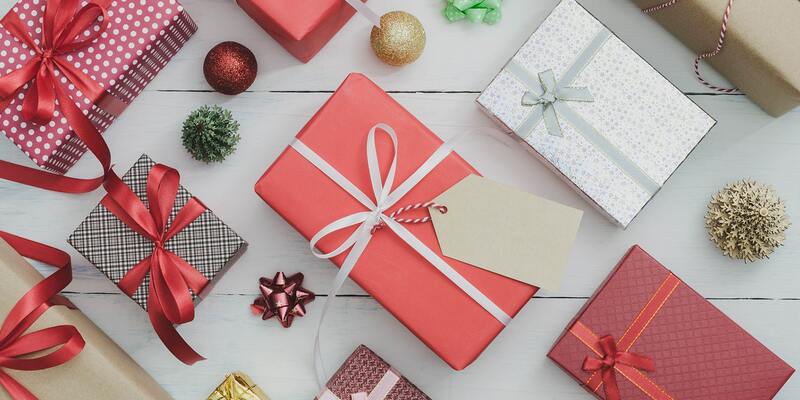 To help you plan your holiday shipping strategy, we’ve compiled this list of holiday shipping cut off dates to ensure that Santa’s gifts don’t accidentally show up on December 27th. Please note: This blog post should be used as a guideline. Shipping cutoff dates and transit may vary depending on factors like origin, destination and product mix. These dates apply to U.S. to U.S. shipments only. Delays may apply to shipments to Alaska or Hawaii. UPS recommends shipping by these dates for your shipment to arrive by December 24th. You can download the full UPS holiday shipping schedule here. The USPS recommends shipping by these dates for your shipment to arrive by December 24th. For shipments to Alaska and Hawaii, the USPS recommends shipping by December 20th when shipping First-Class Mail Service or Priority Mail Service, and shipping by December 22 when shipping by Priority Mail Service. You can read more about the USPS holiday shipping cutoff dates here. FedEx recommends shipping by these dates for your shipment to arrive by December 24th. You can find the full list of FedEx shipping cutoff dates here. Will UPS, the USPS or FedEx deliver packages on Christmas Day 2018? UPS Express Critical Service is available on December 25th. FedEx SameDay City Direct, FedEx SameDay City Priority and FedEx SameDay are available on December 25th. The USPS will deliver Priority Mail Express on Christmas Day. 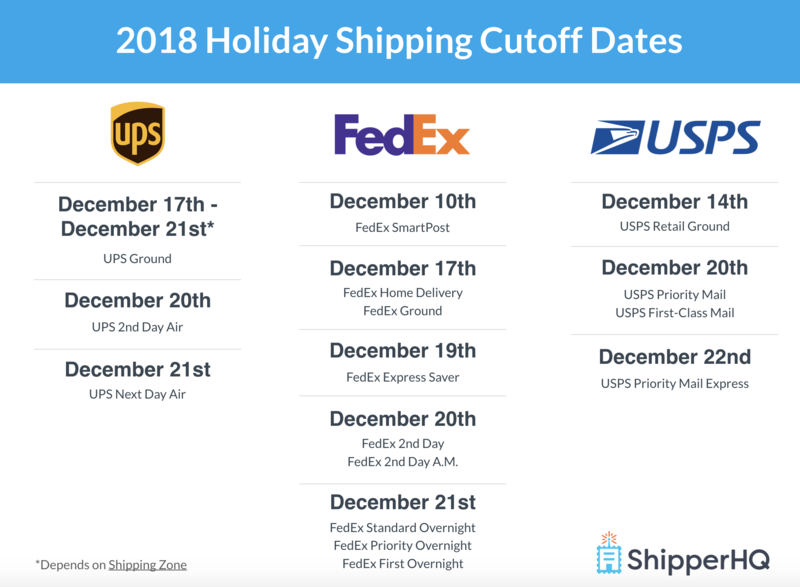 What are the 2018 holiday cutoff dates when shipping internationally? This depends on factors like carrier availability and the country or region to where you are shipping. USPS – The USPS has published their recommended USPS 2018 Holiday Shipping Dates for International Mail. UPS – Visit the UPS Calculate Time and Cost page. FedEx – FedEx provides shipping cutoff dates for shipments from the U.S. to Puerto Rico, Canada and Mexico here. For shipments between other countries, check out FedEx’s Get Rates & Transit Times widget. What are the 2018 holiday cutoff dates to ship to someone in the military/an APO address? Dates vary, but the latest cutoff date listed by the USPS is December 18. See the USPS page on military shipments for a full list of 2018 holiday shipping cutoff dates to APO, FPO and DPO addresses. 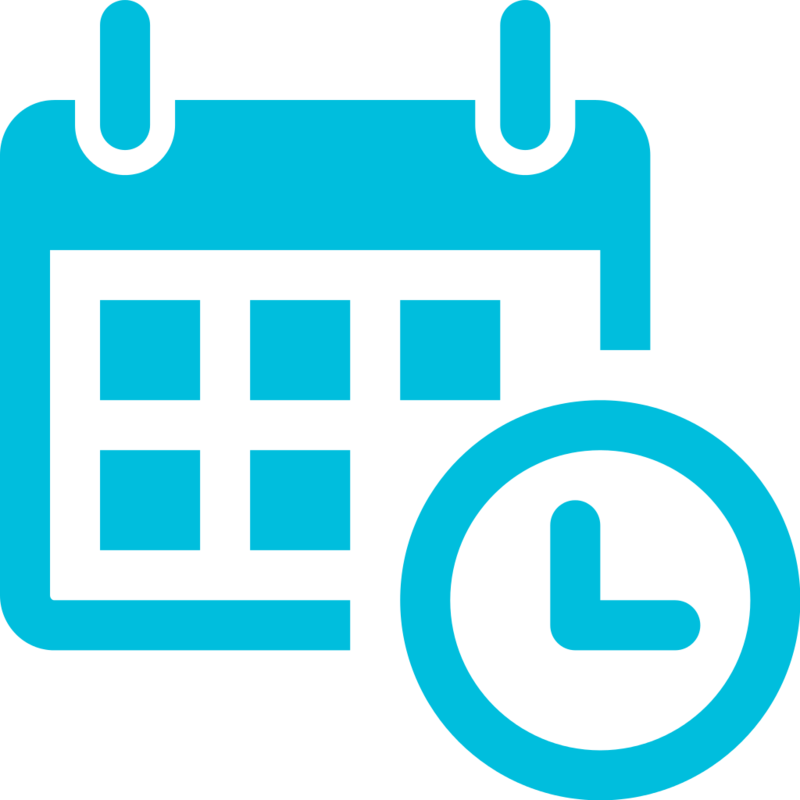 ShipperHQ calculates dispatch and delivery dates right in checkout, so your customers will always know which shipping option to choose to ensure their delivery arrives on time. This cuts down on abandoned carts and anxious customer service requests from shoppers who want to create the right holiday memory. Try a 30-day no-risk free trial of ShipperHQ today. We wish you good luck and swift shipping speeds this holiday season. Do you have any other questions about the 2018 holiday shipping cutoff dates? Let us know in the comments.